Description: SCP-1248 is a Walkman WM-D6C recording device with wear and tear consistent with regular usage. 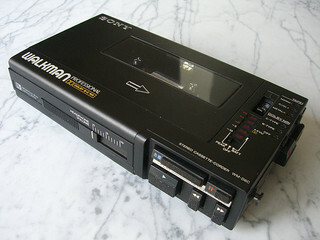 As with normal devices of this model, SCP-1248 is capable of recording sounds when a cassette tape is inserted. The name "Eric" is carved into the underside of the device. SCP-1248’s anomalous properties manifest when a person listens to an instance of SCP-1248-1 with one or more human voices audible.1 Any subject who hears the recording will become listless and unresponsive until the recording stops or the subject is otherwise unable to hear SCP-1248-1. Upon recovery, all subjects will exhibit the personality traits of one person who produced sound heard in SCP-1248-1. This change is permanent and affects all facets of the subject’s personality. However, memories, intelligence, and skills will usually remain unaltered. Special Conditions: Dr. Hathaway had consumed large quantities of alcohol prior to testing. Test was unauthorized. None were aware of SCP-1248's properties. Result: The subject appeared cooperative and attempted to divulge sensitive information regarding a suspected CI base near New Delhi, but experienced severe throat swelling in the process of doing so. In addition, large amounts of scar tissue appeared throughout the subject's respiratory tract. Subject died shortly thereafter of suffocation. Special Conditions: SCP-1248's microphone was blocked prior to recording. 1. Testing indicates that other audio input has the potential to trigger these effects. Further testing is required to determine the exact parameters of this capacity.